Ichiro Koyama’s schedule is filled with lectures, talks and interviews. The 88-year-old, a former soldier in the Imperial Japanese Army stationed in Jinan, Shandong Province in China, believes he has a duty to pass on his war experiences to younger generations. “I’m old now. This may be my last chance to tell what really happened,” Koyama said in a recent interview with The Japan Times, adding that the war turned him into a monster who didn’t hesitate to kill. 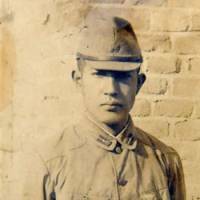 Koyama was working at an ironworks when he was drafted at age 20 and five days later shipped off to Qingtao, China. He later moved to Jinan, which a major general said was enemy territory. One of Koyama’s most terrible experiences was being taught how to execute Chinese civilian prisoners. One day, Koyama saw seven or eight Chinese men from a village in Zaozhuang, Shandong Province, blindfolded and tied to trees. They were being punished because they would not reveal the location of the Chinese Red Army. Seasoned soldiers ordered the green recruits to execute them for not cooperating. With his comrades, he tried to pierce a man’s heart, but was unable to because the victim kept squirming to avoid being stabbed. Koyama eventually bayoneted the man in the stomach and shoulders. After his first killing, he said he was unable to eat. But eventually he started training new recruits to also execute their prisoners, justifying his actions by arguing he had no choice because it was war. Koyama said the new recruits, by this process, also got used to killing. However, one comrade, who used to teach traditional Japanese dance, committed suicide because he could not bear it. The teacher missed training one night, saying he was sick. Koyama told him to rest and left on a two-hour exercise. As soon as he returned, a commander told them the man had killed himself while they were away. The commander decided to report his suicide as death in battle because a suicide during training would be dishonorable. “He was a kind man. He could not become a monster,” Koyama said. 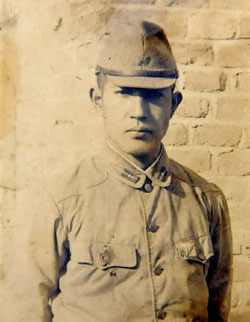 Koyama was mainly involved in patrolling towns the Imperial army had captured, but in 1944, his unit was caught in a firefight with the Chinese army in a village of Shandong Province. It was a surprise evening attack on a farm field that offered no place to hide. 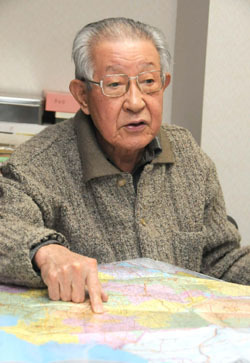 As far as Koyama can recall, seven or eight fellow soldiers died and more than 10 were wounded in the attack. Koyama remembers it took several hours to cremate his fallen comrades, and he found it horrifying to think he himself might be turned to ashes one day soon. On Aug. 15, 1945, he received word of the Imperial army’s surrender while he was in Hamhung in what is now North Korea, preparing to fight the Soviet army. Koyama said he felt relieved he no longer had to face death on the battlefield. However, he and his comrades were captured by the Soviets a few days after the war ended and he was kept in Soviet and Chinese prison camps for 10 years. The five years he was held in the Soviet Union, most of which he spent working in coal mines, were especially tough, he said. He was always starving and ate anything he could, even dandelion leaves. Others who were there were so hungry they mistook bricks dropped on the ground for loaves of bread. “All I did there was count the days until I returned to Japan,” Koyama said. In 1950, he was transferred to Fushun, Liaoning Province, in China. Although he was interned there for five years as a war criminal, he said he was grateful for the good treatment he received. The Chinese fed him three meals a day, unlike the Soviets. 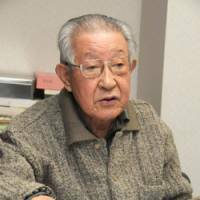 While imprisoned in China, Koyama said he gradually became aware of the tragedy and suffering the war caused and regretted what he did to the Chinese. When put on a military trial in Shenyang, he realized he was trembling, even though he felt ready to accept whatever penalty was meted out, Koyama said. After being told he would be freed, he cried and bowed to the judge. “We must not resort to war to solve our problems,” said Koyama, who is well-versed in world news and domestic politics. Since Barack Obama was inaugurated U.S. president, he said he hopes the world will become more peaceful. In this occasional series, we interview firsthand witnesses of Japan’s march to war and its ensuing defeat who wish to pass on their experiences to younger generations.